Do you identify as LGBTQIA2+ and Christian? Would you like a space to talk with other queer Christians about how those identities intersect and inform each other? Queerly Christian meets on the second and fourth Wednesdays of every month, 7:30pm in the J.B. Martin Room at Erb Street Mennonite Church. We welcome people of all gender and sexual minorities who identify as Christian, regardless of denomination, church membership status, or church attendance. We also welcome allies, but ask that you recognize this is intended as a space for queer Christians to share their lived experiences. 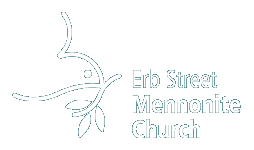 Queerly Christian is a collaboration between Erb Street Mennonite Church and Pastors in Exile. It is organized by Sylvia Hook (Erb Street Mennonite Church), Steph Chandler Burns (Bloomingdale Mennonite Church), and Tamara Shantz (Pastors in Exile / Stirling Avenue Mennonite Church).